(L-R): Chuck Chellman accepting for his late wife Georgia Twitty Chellman, Millie Kirkham, Evelyn Shriver, Roberta Edging and Janice Erickson Wendell. 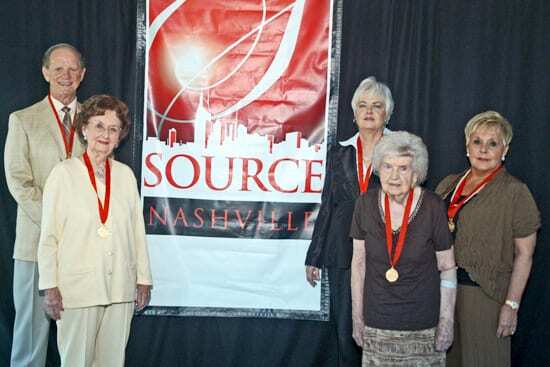 Every year, the SOURCE organization honors the women of Nashville’s music business. This year’s awards banquet, held at the Noah Liff Opera Center (8/25) put the spotlight on Janice Wendell, Evelyn Shriver, the late Georgia Twitty Chellman, Barbara Orbison and Roberta Edging. Kay Smith, who founded SOURCE with Judy Harris and Shelia Shipley-Biddy in 1991, welcomed the sold-out crowd of 250 and explained the SOURCE mission of being a networking, education, financial support and job-bank organization. Kay announced that the SOURCE plaques will have a home in the new Musicians Hall of Fame, thanks to the generosity of Joe & Linda Chambers. When the Municipal Auditorium celebrates its 50th anniversary in 2012, it will do so with a new name, The Musicians Hall of Fame & Museum at Municipal Auditorium. The hallways surrounding the auditorium will hold historical exhibits about the venue. The Museum and SOURCE exhibits will be located in the 68,000-square foot exhibit hall that is on the ground floor. 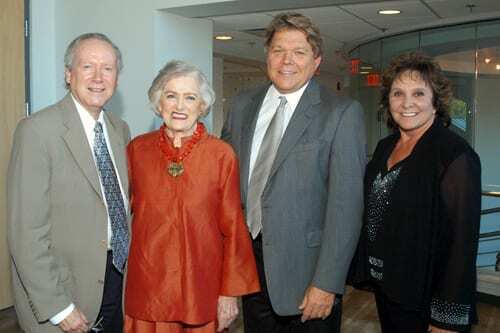 (L-R): MusicRow's Robert K. Oermann, 2010 Source Lifetime Achievement Award recipient Frances Preston, David Preston and Source founder Kay Smith. Jeannie Seely hosted the awards. Current SOURCE president Laurie Hughes gave out the plaques as each honoree took the stage. “I’m amazed at not only our award winners, but all the women in this room,” said Seely. SOURCE membership is now approaching 200. 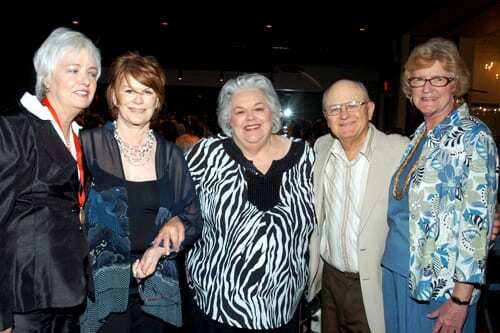 (L-R): Evelyn Shriver, K. T. Oslin, 2008 Source honoree Hazel Smith, Carlie McCoy and 2009 Source honoree Pat McCoy. Millie’s acceptance speech was a delight. Because of the demands of the recording studio, “I wasn’t home to cook dinner for my family,” she recalled. “Thank goodness, a company called Swanson’s came along. My daughter is living proof that you can survive on frozen TV dinners. “This is the first award I have ever won. We had an earthquake and a hurricane on the East Coast, and Millie Kirkham finally got an award.” Hoots of laughter and applause greeted her as she left the stage. Barbara Orbison was honored for managing Roy Orbison’s career, for establishing her successful Nashville music-publishing company in 1996 and for launching Pretty Woman perfume in 2009. She was unable to attend, but we all got samples of Pretty Woman when we left the banquet. After a New York career as a publicist for Diana Ross, Cher, Henry “The Fonz” Winkler, the stars of TV’s Dallas and dozens more, Evelyn Shriver moved to Nashville in 1985. She has worked for Randy Travis, Tammy Wynette, Willie Nelson and many others. Named the SRO Publicist of the Year four times, Evelyn rose to become the first female president of a record label in Nashville (Asylum Records, 1998-2000). She now heads the George Jones imprint Bandit Records. (L-R): Country Music Hall of Fame and Museum Director Kyle Young, Bud Wendell, Janice Erickson Wendell, Frances Preston and Sony/ATV President/CEO Troy Tomlinson. The late Georgia Twitty Chellman (1935-1992) was recognized for her work in television (Gospel Jubilee), radio (Music City Hotline), hospitality (Veeson Travel) and food (Tennessee T-Cakes). She was also an award-winning photographer, helped to found Country Radio Seminar and raised six children. The banquet hall was packed with powerful music-biz female personalities. Karen Conrad, Karen Oertley, Karen Sturgeon, K.T. Oslin, Katie Gillon, Kerry Hanson, Kira Florita, Susan Stewart, Susan Nadler, Suzanne Kessler, Becky Harris, Judy Harris, Judy Newby, Lori Badgett, Laurie Hughes, Caroline Davis, Cathy Gurley, Ree Guyer-Buchanan, Debbie Carroll, Nancy Shapiro, Tracy Gershon, Lyndie Wenner, Diane Pearson, Brandi Simms, Barbara Turner, Betsy Morley, Sarah Brosmer, Shatzi Hageman, Mary Miller, Margie Hunt, Gillie Crowder and Pat Rolfe schmoozed mightily. Past winners attending included Frances Preston, Jo Walker-Meador, Pat McCoy, Liz Thiels, Celia Froehlig, Sandy Neese, Hope Powell, Ruth White, Carol Phillips and Hazel Smith. And lest you think this was a ladies-only event, some of the notable gents in attendance included Paul Burch, Charlie McCoy, Bill Denny, Chuck Neese, Bob Saporiti, Fletcher Foster, Frank Mull, David Preston, Andrew Kitz, Gene Ward, John Lomax III, Jay Orr, Alan Mayor, Chris Dodson, Roger Shriver, Michael Campbell, Sherrill Blackmon, Gordon Stoker, Bud Wendell, Ron Cox, Don Cusic, Kyle Young and Troy Tomlinson. Pianist Ronnie Brown serenaded each honoree with appropriately chosen selections (“Make the World Go Away” for Roberta, “Georgia on My Mind” for Georgia, etc.). 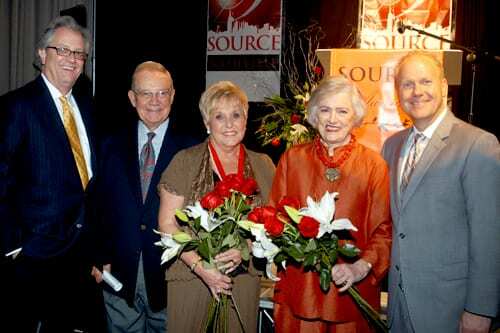 This was the ninth annual SOURCE banquet. This event is always noted for its excellent cuisine, and this year was no exception. We began with tossed green salad with pine nuts, blue-cheese crumbles and strawberries. The main course was melt-in-your-mouth roast beef with mushroom gravy, asparagus spears and the most scrumptious flakey scalloped potatoes I’ve ever tasted. Lighter-than-air raspberry and vanilla mousse with kiwi slices, blackberries and whipped cream finished us off.